Join Bill Murray, Dan Aykroyd, Sigourney Weaver, Harold Ramis, Ernie Hudson and Rick Moranis to celebrate the 35th anniversary of Director Ivan Reitman's iconic comedy classic when Ghostbusters returns to 4K Ultra HD June 11 in an all-new limited edition Steelbook, which also includes the 30th Anniversary edition of Ghostbusters II. The set includes both films on 4K Ultra HD and Blu-ray™, along with an entire additional disc of special features from each film. The films were fully restored from their respective original camera negatives and presented on 4K Ultra HD with HDR and Dolby Atmos audio; the Blu-rays feature HD presentations also sourced from the 4K restorations. The special features disc includes more than two hours of long-requested and rare archival elements-including never-before-seen deleted scenes from the first film-along with returning interviews, effects breakdowns, multi-angle explorations and much more! Both films also feature brand new commentaries, featuring the filmmakers on Ghostbusters II and passionate fans with deep-cut insights on Ghostbusters. The new Steelbook release is part of overall celebrations for the original film's 35th anniversary, which include the exclusive Ghostbusters Fan Fest (June 7th and 8th), an international Live Orchestra Tour for the original film throughout 2019, multiple limited edition 35th anniversary product lines-such as the recently announced Transformers Ghostbusters Cross-Over product-and a variety of forthcoming to-be-announced documentaries. The classic supernatural comedies that defined a generation: Ghostbusters and Ghostbusters II, together in a limited edition 4K Ultra HD Steelbook with never-before-seen special features! 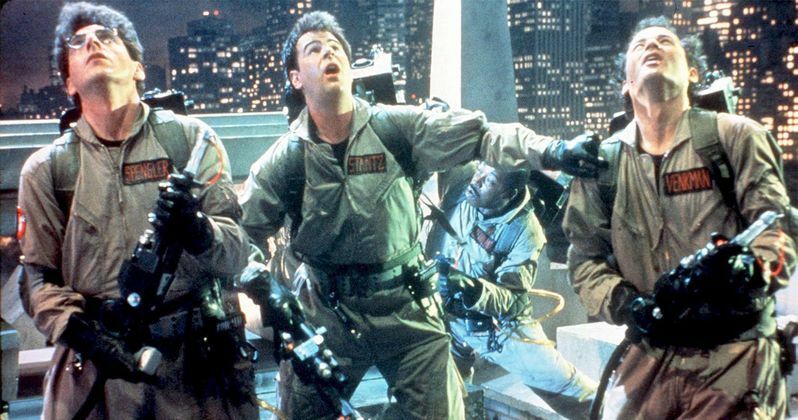 In the original Ghostbusters, Peter Venkman (Bill Murray), Ray Stantz (Dan Aykroyd), Egon Spengler (Harold Ramis) and Winston Zeddemore (Ernie Hudson) go freelance, de-haunting houses in a new ghost removal service. As soon as they open their doors, their first order of business becomes saving beautiful cellist Dana Barrett (Sigourney Weaver) and nerdy Louis Tully (Rick Moranis), who've inadvertently opened the gates of hell...right in their own apartment building! Then in Ghostbusters II, the superstars of the supernatural reunite to battle an enormous underground river of slime that threatens New York City. Ghostbusters and Ghostbusters II were directed and produced by Ivan Reitman and written by Dan Aykroyd and Harold Ramis. • 6 Rare & Newly Unearthed Deleted Scenes, including the long-requested Fort Detmerring scenes! • 1984 ShoWest Exhibitor Reel, featuring Bill Murray and Dan Aykroyd pitching an early reel of footage to theatrical exhibitors! • Rare Unfinished Teaser Trailer - featuring the full commercial from the film! • Ghostbusters Music Video by Ray Parker, Jr.